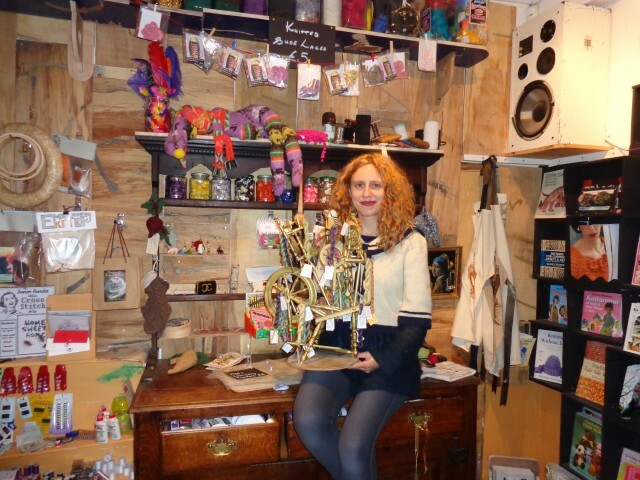 Rachael is co-founder of East London haberdashery Prick Your Finger with the wonderful Louise Harries. They describe their beautiful shop as a “Stone Age Haberdashery Rock and Roll Yarns”. It’s an textile art collective, online yarn shop and resourse space/gallery in Bethnal Green. Rachael is also a craft artist, knitting book author, and ran Cast Off Knitting Club for boys and girls, making events to promote knitting and handicrafts as a constructive pass time which included meeting on the Circle Line to knit with people. Rachael helped make knitting the cool popular thing it is today. A real trendsetter. I first met Rachael (& Louise!) a few years ago in one of my favourite London places- Maison Bertaux because I was annoying our mutual friend Deadly Knitshade (Lauren O’Farrell shhh!) by the fact that I was too nervous to introduce myself and what I do as a craftivist so Lauren set up a tea date with me, Rachael, Louise and Lauren. Rachael is a true artist in that she sees the world in a unique way – always seeing the beauty in other peoples ‘waste’, upcycling MDF boards in to beautiful doors, stitching onto worn out flannels to make them look like a black hole (yep, you heard that right!) and so much more. She also has the mothering quality that isn’t patronising but extremely loving, patient and intrigued to know what your hopes are. I sometimes go over and just have a cuppa, talk craft, craftivism, our vision for the world & craft community, what exciting projects we do together etc. I love hearing her talk to customers who come in nervously asking for help with their craft project. She immediately makes them feel welcome, existed about their chosen project & inspired to finish it. Once Rachael was talking to a customer who said her grandmother knitted a similar project and Rachael said “Well, knitting is in your heritage then, you will be great!” I could go on and on about this incredible woman but why not read her own words below, visit her shop, stalk her on the internet or write her a craft crush love letter! What do you do? I am an artist with a particular interest in knitting. What are your first memories of crafting? I have made things since I managed to co-ordinate my head, heart and hands. What inspires you? Everyday life inspires me. Several things might happen and converge to form an idea. Who do you have a craft crush on? My influences change constantly as I discover new ways of looking at things. 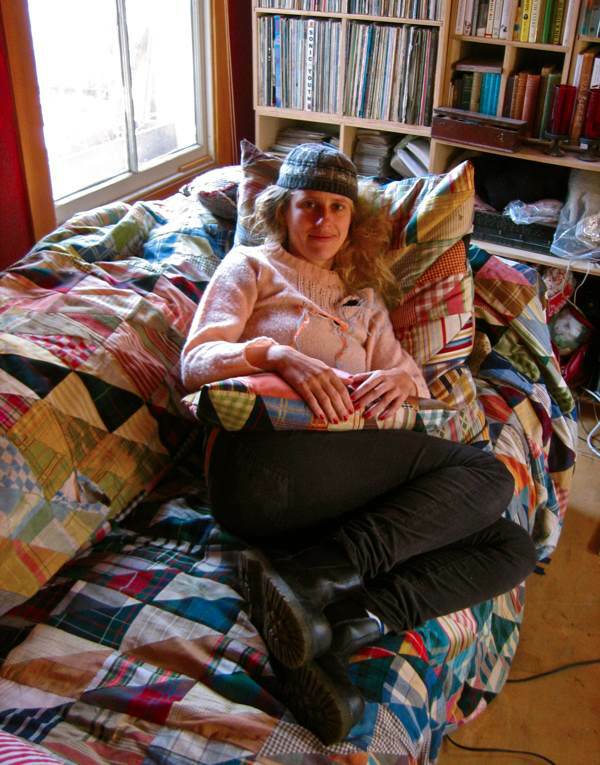 I don’t have any one particular crush, but at the moment I like to look at Kurt schwitterz – Dada artist, George Hardie- Graphic artist, and Russel Mills – Collagist, and Sonja DeLaney for the textiles. How has craft been a positive influence for you, your community or society at large? I did a lot of work in the late nineties early naughties on promoting craft as a fashionable passtime in public spaces. I continue to teach and I run a shop dedicated to selling UK based and ethical yarns. I am constantly influenced by William Morris’s Art Workers Guild, of which I am Honory Secetary. Every week I learn a new way that Arts and Crafts have influenced society at large. Have you got any words of encouragement for our readers about the power of crafts? Just start – make sure you finish what you start, be observant – remember it is all a learning process, and find it funny when it goes wrong…and show everyone you meet what happened..
Rachael is totally ace and well deserving of a craft crush. She taught me how to crochet. I’m just finishing up a shawl in Prick Your Finger’s delicious 4-ply mohair. Yayness all round.